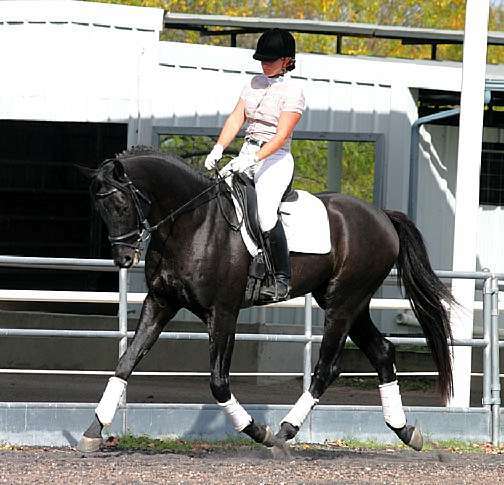 Sonntagskind is the embodiment of 3 of the most famous dressage horses who have ever lived. He possesses greatness throughout. His potential is unlimited. He has an amazing amount of presence, huge ground-covering gaits, and fantastic conformation. You will think you are seeing Sandro Hit as a young colt when you see Sonntagskind. Sonntagskind's bloodlines speak for themselves. 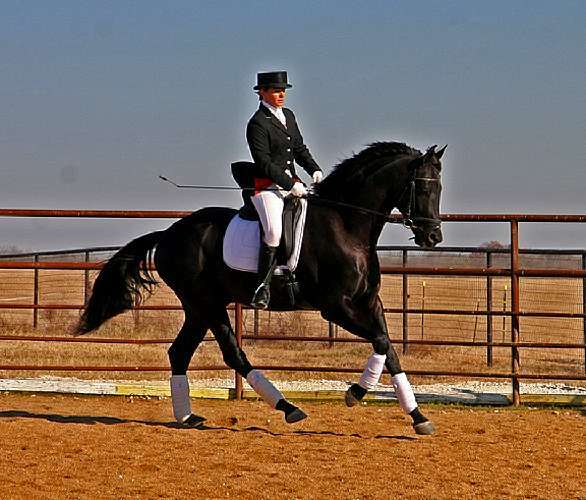 By legendary sire, Sandro Hit, out of an elite Donnerhall/Rubinstein I mare, Sonntagskind combines three of the world's most famous bloodlines in dressage breeding. Sonntagskind is already showing that he has what it takes in the show ring and in the breeding shed to be a fantastic show horse and stallion. 2009 North American 70 Day Stallion Test Reserve Champion! 2009 North American 30 Day Stallion Test Champion! Sonntagskind was the only stallion the USA approved for breeding with the American Hanoverian Society in 2009 and was the highest scoring stallion accepted into the ISR/OLD NA breeding book with an incredible 229 points. Sonntag has not only proven himself in the show ring, but has also proven himself in the breeding shed. He is producing outstanding foals with elegant, modern builds and fantastic movement for the discerning dressage or hunter breeder. He consistently passes on long, elegant legs, beautiful heads and nice, clean throat latches and modern frames. Sonntag’s foals are already making their mark at inspections and breed shows. In Sonntag's first foal crop in 2007, all foals were premium and filly, Heaven Sent was the North American Reserve Champion Filly on the BWP Keuring Tour. In 2008, filly Star Charmer, earned Gold Premium status with the RPSI. We are looking forward to Sonntag's first hanoverian and oldenburg foals in 2010.